Every morning I enjoy waking up extra early to plan my schedule, go to the gym, take a soothing bath and cuddle with Frenzi while sipping on hot coffee. My mornings look NOTHING like that. The morning hustle is real. However I recently discovered Jergens® Moisturizer for Wet Skin and it has helped me get ready a little bit faster and more efficiently! If you have dry skin, especially in the colder months, you probably know that there are very few body lotions that actually do the trick of keeping you moisturized and smooth all day. Jergens® Moisturizer for Wet Skin is specifically designed for you to apply it as soon as you get out of the shower (or bath) when your skin is still not completely dry. That is when this moisturizer works miraculously to seep into your skin and actually keep your skin feeling fresh and hydrated for a long time. 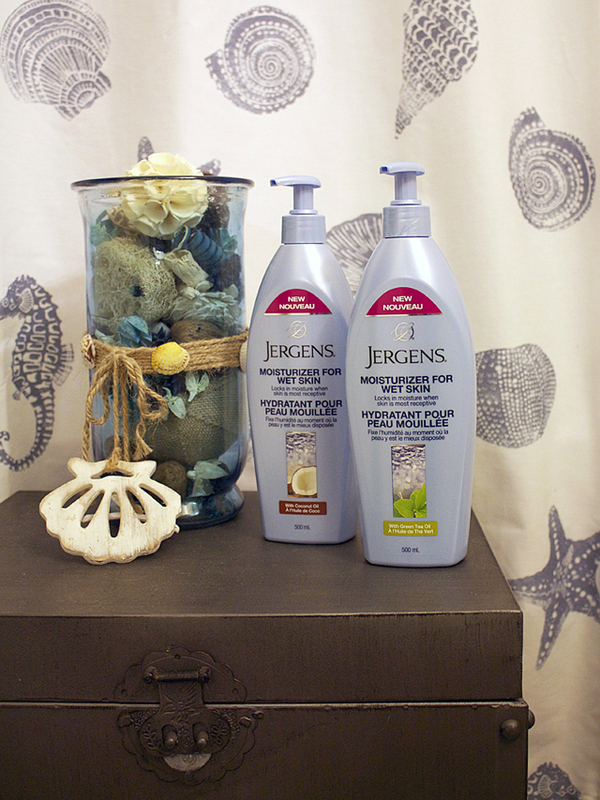 Jergens Moisturizer for Wet Skin with Coconut Oil: It's soft and makes my legs glow! The Coconut Oil formula has a naturally pleasing scent and is very soothing to apply. The trick with these moisturizers is to apply them to your skin when it's still damp or even fully wet for full effect. Once you apply, use a towel or cloth to gently pat your skin and you are good to go! Jergens Moisturizer for Wet Skin with Green Tea Oil: The Green Tea moisturizer is refreshing and a bit more awakening. It takes a while for it to really soak into your skin but once it does, it's truly worth it. Everyone has different bathing habits; about once or twice a week I shower in the morning and that's when I apply the Jergens moisturizer with green tea oil as a way to help me wake up. My shower preference is in the evenings before bed, giving me more time to relax and rinse and that is when I love using the Jergens moisturzer with coconut oil! They are both a win-win for me. What's your morning routine like? I'd love to know! This blog post is sponsored by Jergens®. However, all photos and opinions are my own.